During our 11 week engineering unit, we study Simple Machines, Electricity, Ways to Build Tall Structures and Strong Structures, Building Houses and Cars and Contraptions. We begin the unit by discussing the engineering process. We explain that the engineering process starts when someone sees a problem that they want to solve, or sees something that could work better than it does. They brainstorm ideas for what they could do, given the supplies that they have. Then they start building – they make a prototype. They test it – does it solve the problem and meet their goals? How could it be better? They refine and test again. Our challenge activity was to design a tool to launch a pompom into the air (our ideas included a balloon popper, pompom puffer, and a spoon on a clothespin). Our craft was a paper bag kite. We did several tinkering activities during free play. During circle, we learned about the scientific process with a song, then read a book about an inventor. At the bottom of the post, you’ll find take-home activities and recommended kids’ videos about engineering. When they come to the challenge table, we tell them that their challenge is to figure out how to launch a pompom into the air. We have lots of materials on the table, and we have three prototypes to show them that they can test out. They can choose to build one of those, or create any other design from the materials available. Our 3 year old students tend to pick one design and their parents help them build it. Our 5 year olds may try out a couple of designs with the assistance of a parent or teacher. Our 7 year olds (who have typically been in the class in a previous year) tend to get creative. Once any child has built a successful launcher, we challenge them to refine it. We offer some goals: could you make it launch more than one pompom at a time? How could you make it launch the ball further? Can you hit that target – if not, how could you make your launcher more accurate? They can choose to tinker and refine as much as they want to. Just tie a balloon (no need to inflate it), then cut off the rounded end and stretch that opening over the end of a toilet paper tube. That’s it…. To use: Hold it with the open end of the tube facing up. Load it with a marshmallow, pompom or whatever, then pull down on the balloon knot and release to launch it. The pompom will likely hit the ceiling. Optional: if you find your balloon is pulling off of the tube when you pull on it, just tape it in place. Variations: On Coffee Cups and Crayons, she describes doing this with a cake pop container. Paging Fun Mums uses a plastic cup with the bottom cut off. On Frogs and Snails, she uses a pool noodle, which would be good for little ones who might crush the toilet paper tube by holding too tight. Cut a circle from cardstock, cut a small hole in the center, roll it into a cone shape, and tape to a bendy straw. Then you set a pompom in the cone, and blow through the straw, trying to keep the pompom afloat in the air over the cone without escaping. (I got the idea online, and I try to always credit my sources, but I lost track of where this idea came from. 😦 If you know, please note source in the comments!) Here is a PDF with my directions and a template for the circle. 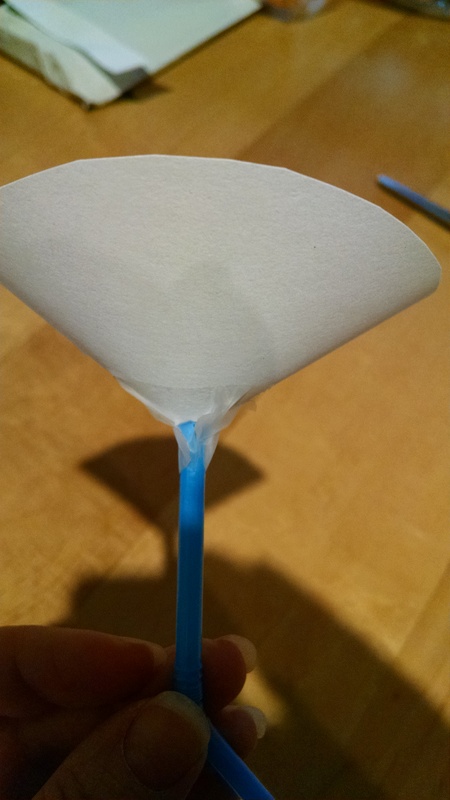 Or, if you have Sno-Cone Cups, you can use those instead of building a cone – you just snip off the very tip of the cone, then tape it on the straw. Take a plastic spoon. Insert it into an old-fashioned clothespin , tape it tightly. To use: put a pompom in the spoon. Hold it in place with one hand while you hold the clothespin in front of you with the spoon at top, facing away from you. Pull the spoon back, and let go. You could also offer craft stick catapults as an option. The only reason we don’t is because we’ll be building them a few weeks later in our Levers class. Someday I plan to test the indoor slingshot balloon popper gun from Design Squad or Frugal Fun. We chose this activity for two reasons – it ties into our book about inventor Margaret Knight, and it was a good tie-in to the next week, when we would study Wind and Flight. Find directions at Kinder Art, Sophie World, or Somewhat Simple. There’s a great website called Talking Math with Kids. He used to a product called the Pattern Machine (picture is from his site). You press the button and it pops up. Press it again and it stays down. (You can make your own by taking a multiplication machine and covering the numbers with stickers.) This activity is fun for even little kids to do, and it good for fine motor skill building. But it’s also a mathematical thinking tool. 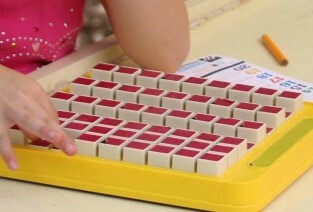 Kids use it to create and recognize patterns, which just seems like fun to them, but is also training the brain. They may try something like all buttons up, or every other button up, or all the buttons in every other row up, or all the buttons on the outside edges up or they might use it to make letter or number shapes with. Any way they use it is fine with us – it’s a process oriented activity. At the sensory table, we built an apparatus from cardboard and styrofoam to pour brown rice over and through. At the water table, we made a PVC frame that we hung funnels from. We ask: What’s an engineer? Why do they build? Discussion leads to the answer that engineers see problem they want to fix, or something that could be improved. (Or they think of something that would be really cool to have.) They take on the challenge of building it. Talk about Tinkering / the Engineering process – they brainstorm ideas for what they could do, look around to see what supplies they have available to them that might work, build a prototype (and as they build, they usually get more ideas and adjust their original design. Then they test it – does it work? does it solve the problem? They fix it (“tweak” it) till it works just right, and then show it off. We have a song we wrote which walks kids through all the steps in this process. You can find the words in my post about Kids’ Songs about Inventing. Marvelous Mattie is about Margaret Knight. I like that it tells some history, it features a female inventor, and it starts with her inventing as a child. The main invention it describes is the flat bottomed paper bag, so I do a demonstration to show why this bag is so much better than the flat bag it replaced. Read more about the Marvelous Mattie book. Another good book to consider is Whoosh! : Lonnie Johnson’s Super-Soaking Stream of Inventions which is a story about an African American inventor and starts with him as a boy excited by science and inventions. Check out my post on 100 Kids’ Books about Engineering for more ideas. I give parents suggestions for videos they could use to preview or review the class content. For this topic: For 3 – 4 year olds, “Sid the Science Kid Engineers a Solution” – about 20 minutes long. For 5 – 7 year olds: “Jessi has a problem” from Sci Show Kids https://www.youtube.com/watch?v=RM04n0-QtNo OR “What’s an Engineer” from Crash Course Kids https://www.youtube.com/watch?v=owHF9iLyxic. These are both short – maybe 5 minutes each? Children’s Engineering Educators offers free resources of their own, and links to other helpful resources. NAEYC has a nice overview article on Engineering Practices in Preschool.